I am told I write way too much in my blog posts, so I will try to contain myself. I will say though, that I have been working on the Love at First Glance Proposal Venue for several months, so today is life giving birth to a baby — triplets in fact! The idea with this is that you rez it out in a nice location, and with a few clicks you have a wonderful venue to pop the question to your love. Or if you are a public sim that caters to romance, you might want to offer a wonderful place for proposals for your visitors. 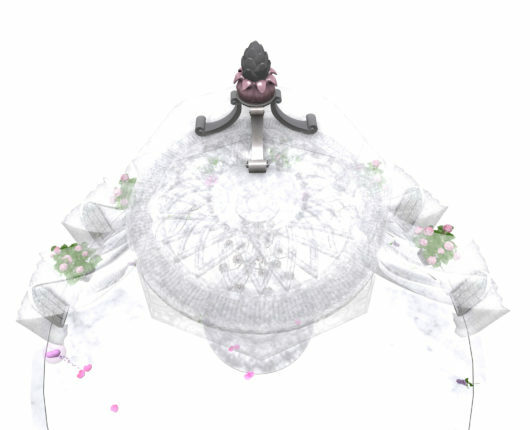 The base module consists of a romantic structure created from a round base with lace panels flowing from a domed cupola medallion. Gothic windows, pineapple finial and an extraordinary crystal chandelier complete the piece. Love at First Glance contains 6 seamless, synchronized couple animations that can easily be adjusted for each avatar. The menu can be driven by either person, but the one doing the proposing sits first. The other cool part of this is that the animations and additional decor elements are rezzed from the base module. So rez as many or few as you wish. The rezzing menu has security, so that the owner can set it up the way they like, and lock the stuff in place. Or set to group. 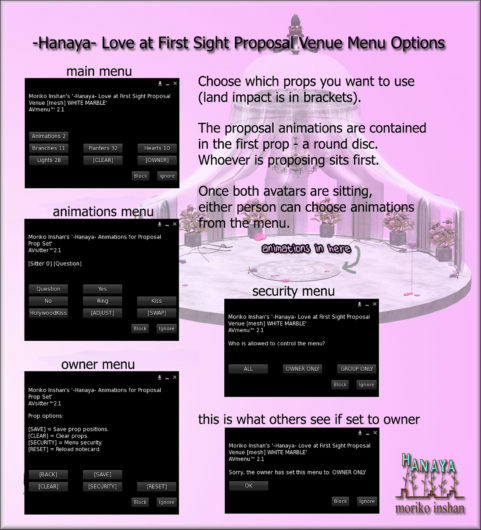 The -Hanaya- Love at First Glance Proposal Venue is making its debut at the 2016 RFL Home & Garden Expo, and is also on display at our in-world store and on the Second Life Marketplace. Come try the animations (with a friend) and grab a size demo if you like. This entry was posted in Events, Product Announcements and tagged love, proposal, Valentine's Day on February 12, 2016 by moriko.